Once I got the machine completely threaded—and verified with the husband that I wasn't going to trip any breakers or set anything on fire when I plugged it in—I turned it on and did a test seam. Unfortunately, I hadn’t gotten the presser foot clicked back into place correctly and the left (chain stitch) needle hit the foot and broke. I replaced the needle and made note of the size so I could order more. Parts are still readily available for this machine. I still have the samples I had stitched on the machine in the store before I bought it, so I was able to compare them. I want to play with the tension between the right needle thread and the lower looper a bit, but other than that minor detail, this machine is stitching perfectly. I can’t get over how quiet it is. My domestic serger always sounds like it’s chewing up garbage (and that’s normal, apparently, for that machine because the ones I see in YouTube videos sound exactly the same). 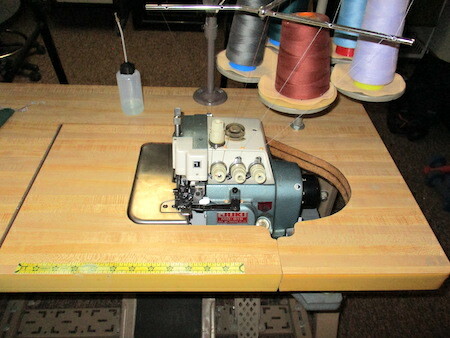 This serger barely makes a sound. It’s also easy to control the speed even though it’s a clutch motor. It is just a very smooth clutch motor. All of that before 9 a.m. I was pretty pleased with myself. This machine and I will be friends. I’ll be churning out a stack of grocery bags soon. I have to get myself a chair, though. I brought the chair down from the Necchi industrial but now that machine doesn’t have a chair. Time to hit some thrift stores. Of course, the husband’s first question upon seeing the machine in action was, “Now can you make me some seat covers for my truck?” He has been asking me that question for years. Yes. Now I can make some seat covers for your truck. I spent some time listing sewing machine parts for sale on eBay this week. These are Elna and Bernina parts and I don’t have models of either of those brands. Getting the sale listings set up is relatively easy. The hard part is deciding on a price. I can look at sold/ended auctions and see what similar parts have sold for, but sometimes I can’t find anything comparable. I don’t want to accidentally sell some very valuable and sought-after part for $5, you know? I’ll list more of what I have on eBay and perhaps I’ll start looking at thrift stores again. The husband also has some stuff he’d like to sell. I still need a good winter purse. The Bramble Bag works perfectly for me, but the one I made of red waxed canvas is more of a summer purse. I looked at my stash of vinyl yesterday and thought about making a bag out of a piece of that, but then I had a good talk with myself and decided that I need to finish the bags I have started before I start yet another one. The seatbelt webbing is supposed to be arrive tomorrow and finishing the two travel bags is on the schedule for this weekend, especially if we get the snow event that is predicted. I knocked out another four Ritzville quilt blocks and added them to the pile. I’d still like to get that top done by the end of January. I am up to 30 blocks now, which is about the halfway point.